One of the most frequently levied criticisms against the free-to-play model is its low intrinsic conversion rate: most players (usually more than 95%) will never monetize. In trying to increase revenues, are developers of free-to-play games better served by increasing conversion or by increasing the average revenue per paying user (ARPPU)? The low conversion rate of the free-to-play model is not itself a feature but is rather the outgrowth of a completely different phenomenon: a purposefully low barrier to accessibility (a price point of $0). Free things are acquired by end-users in higher volume than things which cost money; by virtue of the increased accessibility, any free-to-play game must endure low conversion rates. The question is whether a game studio can increase revenues to a higher degree by incrementally (.5-2%) increasing its conversion rate or by extracting more revenue from the users that convert. I believe the former option is the better strategy in most cases – the exceptions being when monetization has been poorly implemented and can easily be improved upon, or when the conversion rate is already at the high end of the likely potentialy range (7-8%). But given equally-optimized monetization curve and converstion tactics, I believe the more fruitful endeavor will be that of focusing on conversion: more personalized items for sale, and more refined targeting techniques driven by analysis. My reasoning for this belief is informed by the shape of the monetization curve, which follows not a normal distribution but a pareto distribution. 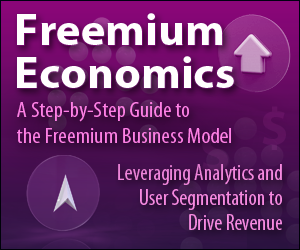 I first introduced the concept of the freemium monetization curve in this post. The graph below depicts the curve: the Y axis represents percentage of the user base, with the left-most point demarcating game’s conversion rate (because that percentage of players paid at least the lowest IAP price), and the X-axis represents the lifetime customver value horizon. Were the monetization curve normal – the bulk of purchases occurring in the center of the LCV horizon – increasing ARPPU would make more sense. But the majority of paying users do not lie in that region; the majority of users exist at the left-most region of the curve. “Mega whales” are statistical outliers; increasing their ARPPU, or the ARPPU of users at the center of the monetization curve, has less of an effect than shifting the curve upwards (with a higher conversion rate). Increased conversion captures additional revenue principally from the portion of the curve that is densest. The choice regarding increased conversion or increased ARPPU is essentially a question of shifting the entire monetization curve up (increased conversion) or shifting its curvature to the right to incorporate higher lifetime value points (increased ARPPU). Given the pareto distribution, the bulk of the value captured from shifting the curve to the right comes from the areas of the curve which are least dense. Shifting the curve up captures additional value from the entirety of the curve. The most effective means of increasing conversion (while keeping user throughput – new users per day – constant) is to offer users more of the things they’re inclined to buy through behavioral targeting. Freemium and “big data” analytics go hand-in-hand – the reason the freemium model is viable is because a large number of users provides for a rich data set from which to build targeting mechanisms and personalized experiences. Pricing may not offer an effective route towards higher revenues: while an across-the-board IAP price cut might increase conversion, if implemented haphazardly it could also reduce overall revenues. A better alternative is to create a sales / promotions carousel in which discounts on items in the center of the product catalogue’s price scale are rotated constantly (discounts on high-end items may alienate players that paid full price for them). This one-item conversion impetus has less of an overall revenue effect than an across-the-board price cut. The systemically low conversion rate of the freemium model is by design – it’s not a defect but rather a symptom of a model that favors scale over immediate monetization. But where the choice is forced between attempting to extract more revenue from users at the highest end of the freemium monetization curve or shifting the curve upwards, I believe shifting the curve will be more effective. The shape of the freemium monetization curve is integral to understanding the dynamics of how revenue is generated in free-to-play games. How do mobile marketers think about LTV in 2018?